Series “Les Yeux des Tours” (2015 – 2017). Tours Aillaud, Nanterre, France. All images courtesy Laurent Kronental. Phidala. Cut paper, gold leaf, 24″ x 30″, 2017. Artist Eric Standley (previously here and here) laser cuts sheets of paper, creating intricately patterned forms by stacking the sheets over 100 layers high. The final works reflect classical stained glass windows, and are inspired by geometric patterns found in both Gothic and Islamic architecture. Recently these designs reference fractal geometry, a rhythmic pattern that is self-replicating. 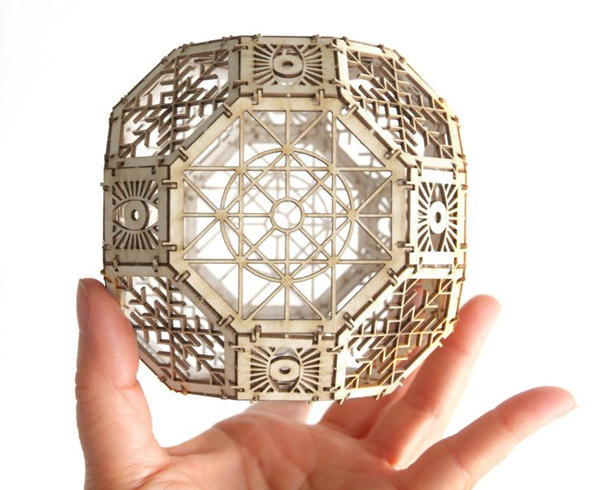 Standley applied this golden ratio during the construction process for his pieces Kismet and Phidala. Using phi as a guide for certain compositional decisions, Standley deviated from his typically strict mathematical rotations. Standley’s solo exhibition Strata at Marta Hewett Gallery in Cincinnati, Oh contains both of these new phi-centered works, and continues through June 3, 2017. You can see more of the artist’s works on his website. “More Sky,” a thesis project by architect Aldana Ferrer Garcia, gives those with cramped apartments the chance to spread out—out beyond the walls of one’s living space. The project merges a window, lounge, and skylight, surrounding users in natural light while providing a bit more space just outside their apartment’s confines. Each of the concepts serves as a niche that can provide more access to natural light and nature within an urban environment. “Hopper Window” allows a nearly full recline, the owner able to glance up into the sky while resting against the accordion-like window. The second, “Casement Window,” is a small semi-circle protruding from the wall, giving a single person the ability to sit cross-legged while glancing out of the overhang. The third, “Awning Window,” is the smallest of the three, just enough room to lean against while glancing down at the world happening below.